A lot of people have in inquiring about changing transcripts by judges in federal court in Manhattan. Some have reported it is taking place in other courts now. Corruption is consuming the Judiciary and we have no power to stop it. The rule of law has been so destroyed that those in the legal profession do not grasp what they are doing to the nation. Once you become biased and start playing with court rules, documents, and evidence to win convictions and protect local industry, you have destroyed property rights. How can anyone do business in New York City with confidence that they can sue a bank and actually win? This is part of the decline and fall of the West. We are sealing our own fate with judicial corruption. The absurdity of the Judicial corruption in New York City is illustrated by two serious events. The first was throwing the press out of court and denying a public trial. 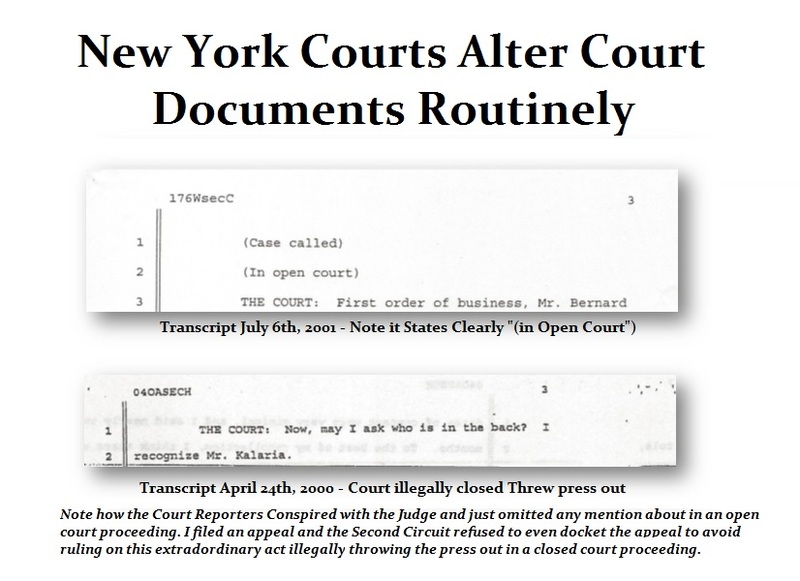 The proof that this was not just a typo since the transcript that day omitted all events throwing the press out is the transcript does not say “in open court” omitting any such mention. The Associated Press was thrown out that day in court. The reporter walked right up to the bench and said “We are the Associated Press. You cannot throw us out of court.” The judge ordered the marshal to removed her. 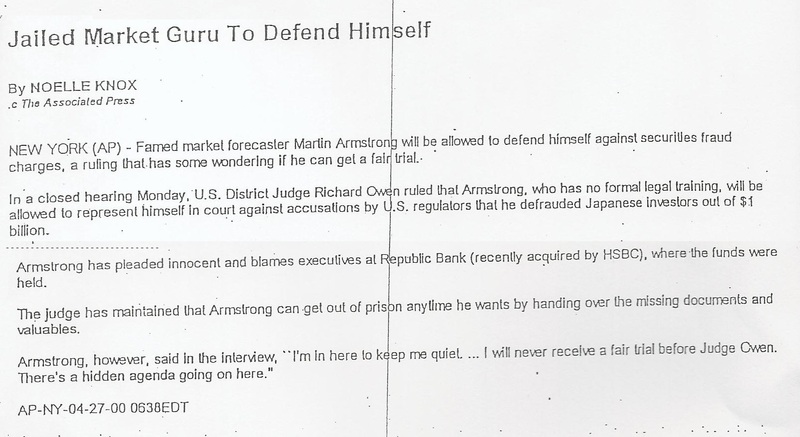 They then reported the fact that the court was closed and finished the article stating there was a question if I could receive a fail trial in New York City. For that to even be printed in the United States was amazing in the land of equal justice for all. It was after that incident when the press flipped and were no longer being negative on me. The word spread quickly that something was rotten in NYC. That was extraordinary for the AP to even print. Despite submitting that as part of an appeal to prove the judge threw the press out and denied me a public trial guaranteed by the constitution, the Second Circuit ignored the appeal and refused to even docket it. I submitted an affidavit of all the changes Judge Owen made to the transcripts changing the words spoken in court. The courtroom was packed that day to watch what would happen when I confronted Judge Owen in public for his crime. He just admitted to changing my transcripts, denied he did anything material, refused to allow me to cross-examine him, and refused to step down. Again the Second Circuit refused to docket the appeal and once again denied Due Process of Law – the right to be even heard. The Second Circuit Court of Appeals is by far just corrupt and is a disgrace to the dignity of the nation and all the people who died in war to defend our Constitution. They should stand trial for treason. You cannot have a free society when the rule of law is not obeyed. Refusing to docket appeals from throwing the press out and criminally changing court records, confirmed that the Second Circuit court of appeals was morally corrupt since they would not dare to even admit what took place all to protect the banks. 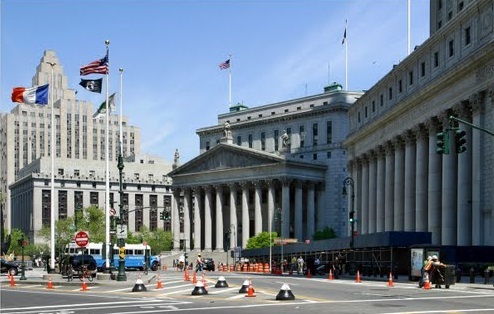 Capital is just not safe if you have no right to be heard in federal court in New York City. That becomes COUNTRY RISK, which has been one primary reason holding back China from becoming a reserve currency. If China honors the rule of law more than New York City, then you will see the capital shifting as our model warns after 2032.